Corbett immigrated to New York with his family in 1839 and became a hatter in Troy, New York. Like many in that trade (who were exposed to high levels of mercury), he suffered symptoms of mental illness, became a religious zealot, wore his hair long in imitation of Jesus, and (in 1858) castrated himself with scissors in order to avoid the temptations of prostitutes. 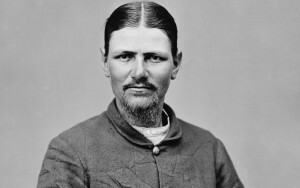 He joined the Union Army in the Civil War and, on April 24, 1865, was one of 26 cavalrymen pursuing John Wilkes Booth after the assassination of Abraham Lincoln. Corbett and the others ran Booth to ground on April 26 in a Virginia tobacco barn. The soldiers set the barn on fire to smoke Booth out, but when Corbett saw Booth silhouetted by the flames, he shot him with a Colt revolver. Paralyzed, Booth died within hours. Corbett was arrested for disobeying orders, but the charges were dropped by Secretary of War Edwin M. Stanton and Corbett was awarded $1,653.84 as his share of the bounty on Booth. Corbett died in obscurity, having suffered from mental illness for the rest of his life.